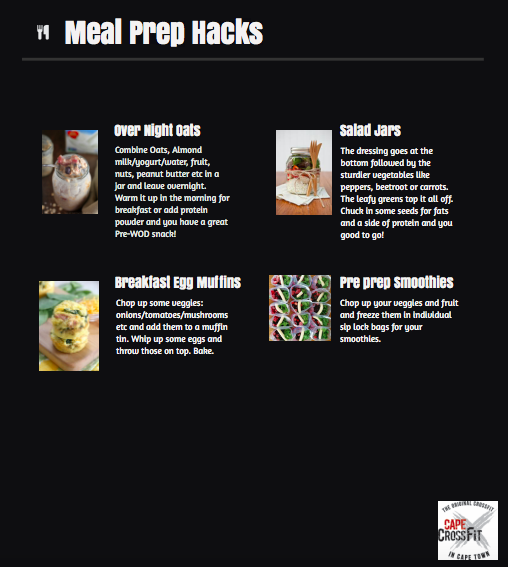 CCF Eat Healthy Challenge - Week 2: Meal prepping made easy. NB: If you haven't joined the Challenge yet, you can still do so by booking a Skill Sessions and getting your measurements and photos taken before the end of this week. We are also stoked to announce that The Whole Food Pantry are sponsoring food boxes to the top 3 winners in this challenge! (The challenge will run for a total of 8 weeks from last week Monday). By now you have an idea of what you want to eat, how much to eat and when to eat it. You are motivated and are dead set on demolishing this challenge. You have booked your classes and set out your gym clothes. You have all your Whole30 approved recipes in a file. Now what? In order to constantly eat healthy balanced meals whilst still living in the real world we need to do a bit of preparation. Food prep. As shudders ripple through your tupperware at the thought of prepping your weekly meals please bear in mind that it isn't all about cold rice and nasty tinned tuna. We want you to have fast healthy options in your fridge that taste good and help you achieve your goals and these following strategies are going to make your life a little bit easier and may even afford you more time. Shop for all your ingredients. A slow cooker is a really good investment that keeps on giving. One pot meals remind you of Grannies and are life savers. Over night oats are a food hack from the gods themselves. So are salad jars. Make extra of whatever the night before and use it for lunch. Duh. Smoothies are quick and easy to prep. Cut up your ingredients, freeze them in individual bags and viola! Bang them in your blender and away you go. If you guys need anymore inspiration check out our Pinterest account. 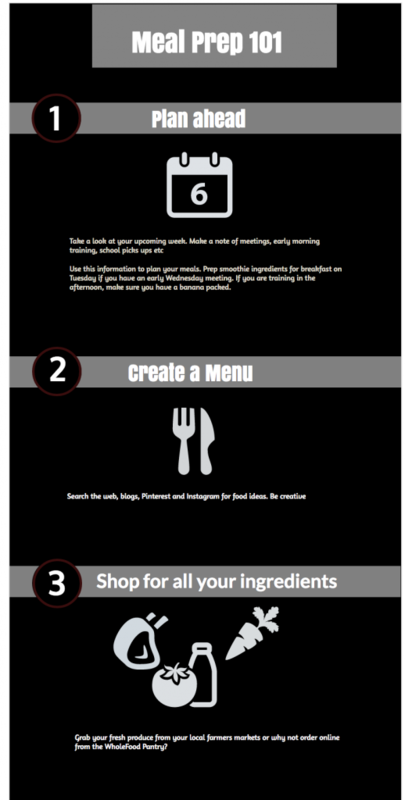 We have a ton of recipes and meal prep ideas that will really set you up for success over these next two weeks! Coach Tash CrossFit Level 1 & Level 2 CCF Nutritional Advisor ------------------------- This is the second in an 8 week series of articles that will help you improve your healthy eating habits. They are meant to be a guide and a support, but just like anything you need to figure out how it works for you.